Once the veneer has been glued on the surface it has to be finely flattened before staining. Then varnish is applied for polishing. High gloss surfaces need special care. Polyester is applied in several layers. It has then to be smoothed with 6 different grains of sandpaper before polishing. This is done by buffing with cloth wheels which are pressed against the surface. It is a long process to bring out the high gloss by burnishing with fine waxes. 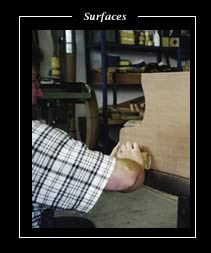 It is left to highly experienced polishers to produce the fine gloss. Any small mark could blemish the finish.